Wow. I was thinking many of those things you just mentioned about the Chinese movies. I agree about it all. I don't see it as a problem to me to watch those movies, but yes it is a bit sad that they keep reminding you of that past. I did love Shaolin Soccer though :D. Hopefully they will make more positive Kung Fu movies or Martial Arts movies in the future. I don't know about Legend of the Fist with Donnie Yen though, since it was first made by Bruce Lee, if I'm correct. And I have not seen the original, but could be it was also about Chinese/Japanese which the new one was so much about. 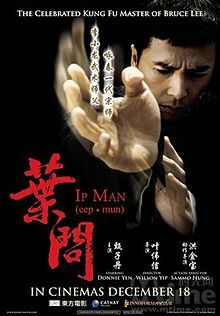 But Donnie Yen is still master nowadays though :). Bruce is a god. There's one movie called Heroes of the East in which a Chinese martial artist marries a Japanese woman. It turns out that she is a practitioner of Karate. The two styles clash and it leads up to a duel between the Chinese martial artist and masters of various Japanese fighting styles. The movie is very different from most Kung Fu movies because each Martial Art is portrayed with respect and none of the duels end in death. There is however one moment when the Chinese martial artist criticizes the art of Ninjutsu, calling it "an ambush suited for bandits" or "murder" depending on which dub you watch and states that Chinese martial arts is about being open and fair. That could just be point of view. The movie is now on youtube if you want to check it out. But it's dub, and I don't know if you'd prefer sub. Interesting - thanks Anon. I'll have to check it out sometime.